The book takes a global view by exploring the interplay of political and media transitions in different pathways of democratization that have taken place in Eastern Europe, Latin America, Africa and Asia. It will be of interest to advanced students and scholars who want a better understanding of the media outside established Western democracies. The book will also be of great value to policymakers and activists who are involved in strengthening the media in transitional democracies. Katrin Voltmer is senior lecturer in the Institute of Communication Studies at the University of Leeds. PART I:WHAT DEMOCRACY - WHAT MEDIA? "Voltmer's comprehensive book skillfully integrates key concepts from media studies, journalism studies, and political science to illustrate the roles of various forms of media in different types of post-authoritarian democracies. Highly recommended"
"Voltmer offers the most comprehensive analysis of the media and political transitions that I have encountered"
"The scope of Voltmers book is astonishing  it resembles an ocean where geographic magnitude meets with broad and fundamental themes. Voltmer navigates quite elegantly in this space posing remarkably clear questions and logical examples"
One of the first books to publish in Polity’s new series: Contemporary Political Communication. 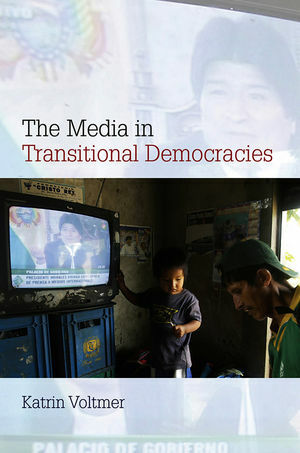 Provides an accessible and systematic introduction to the media in transitional democracies. Analyzes the problems that occur when transforming the media into independent institutions able to inform citizens and hold governments to account. Takes a comparative view, exploring the interplay of political and media transitions in Eastern Europe, Latin America, Africa, and Asia. Will be both an authoritative introduction to this key topic and a contribution in its own right.